If you've already enjoyed the anime series, then this manga is a no-brainer. While not as sharply defined as the anime, what is essential reading here is how much gets through at just 4 panels at a time. Not everything is spelled out, your brain has to fill in the gaps, and then the humor hits you. And it hits hard. Sometimes you'll be laughing so much you'll need to put the book down and go get a glass of water. Which reminds me... *WARNING: Do not read with mouth full*. 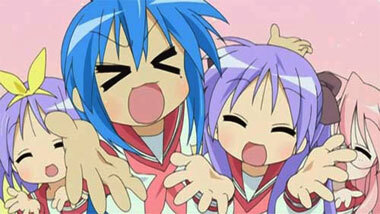 Lucky Star is indeed a sensation. It made the New York Times 10-best selling manga list, and Bandai had to just perform a second printing of the first book in the series, as they totally sold out. And it's easy to see why. As a manga and anime series "about nothing", it seems to cover a wide range of esoteric topics, such as how to properly eat pastry. And yes, it's funny as hell. Enjoy! Think cute, cavity cute. Add in a bit of inane humor. Stir and let it boil on the stove a bit and you just might get Lucky Star. It's been compared to South Park with less cursing and better animation but I think it's more like an animated version of Seinfeld. If you've never heard of Seinfeld, I feel so bad for you because you've been living under a rock for the last decade or two.., but then you should feel a little bad if you do know what I'm talking about because that means you're OLD enough to know what I'm talking about. In any case, I digress, I guess. 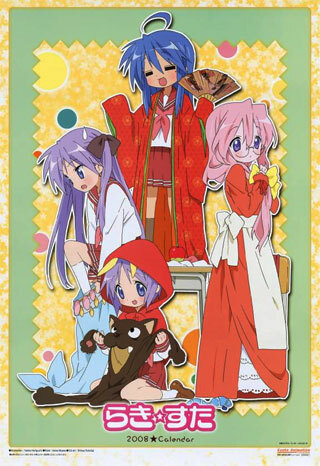 If you choose to watch Lucky Star, which started off as a comic strip, be prepared for an anime that digresses worse than me and goes off on tangents that seemingly have nothing to do with each other. Also, be prepared for the funniest discussions on the most mundane and boring stuff that life has to offer. Centered on four friends in high school, we find out the little questions that they have about life, desserts, homework, hard work, and most importantly how much sleep does Tsukasa need. I agree with Tsukasa: a person needs at least 16 hours of sleep. 8 hours is more than enough to use for going to school, play video games, cram for exams, and copy your sister's homework. Sure, I'll miss out on seriously paying attention to homework and maybe talking on the phone with classmates but copying homework is good enough to get me through class and I'll see my classmates at school the next day anyway. 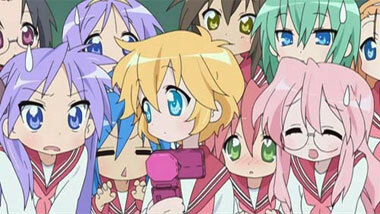 There is no clear cut storyline to Lucky Star so please don't expect them to graduate from high school at the end of the anime. 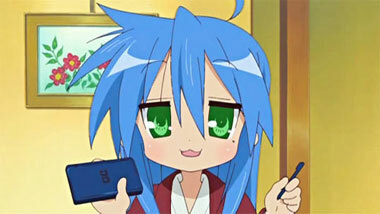 The way Konata-chan is, I'll be surprised if she'll ever graduate. 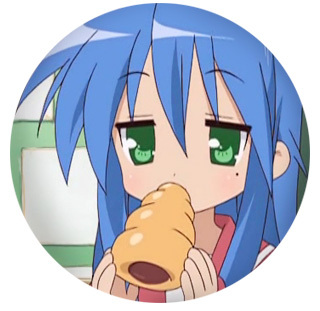 Skirting by life with the minimum requirements, Konata plays the days away and enjoys every moment of her life. I think what she wants to be when she grows up is a professional video gamer; she's beaten everyone that ventures into their hometown arcade already. If there is a way to cut corners, she'll find it. She's proven that cramming actually works and gets better grades than working hard at it like Kagami, Tsukasa's fraternal (maybe identical) twin. Brains is nothing compared to brawns, because brawns can always beat brains into submission. Society's opinions don't matter either because all society ever does is put boundaries on everything. What fun if there to life if we are all bound by something? 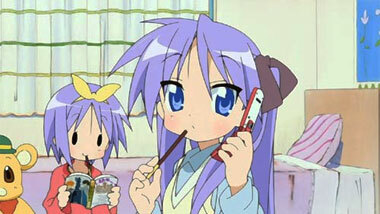 If you want an anime that you can pick up from any episode and have some mindless fun about the boring stuff that is called life, check out Lucky Star. Have fun contemplating about which end of a scone is considered the beginning and the horrible unthinkable implications of eating a scone *gasp* the wrong way. 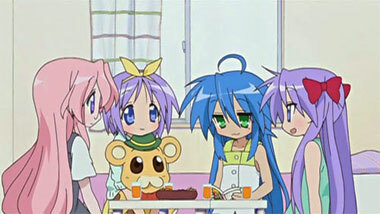 Below: Scenes from Lucky Star. 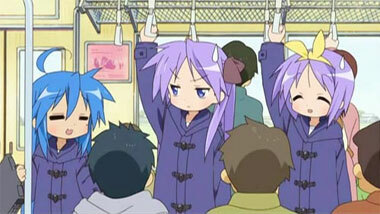 Below: The trailer for Lucky Star in English. 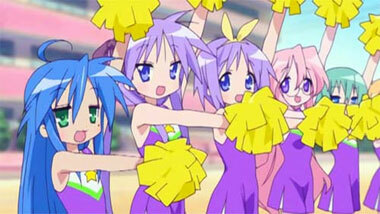 Below: The Japanese trailers for the Lucky Star OVA. 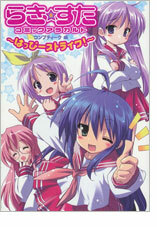 Below: Cover of the 2008 Lucky Star Calendar. 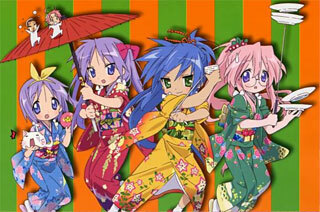 Below: Promotional artwork for Lucky Star.